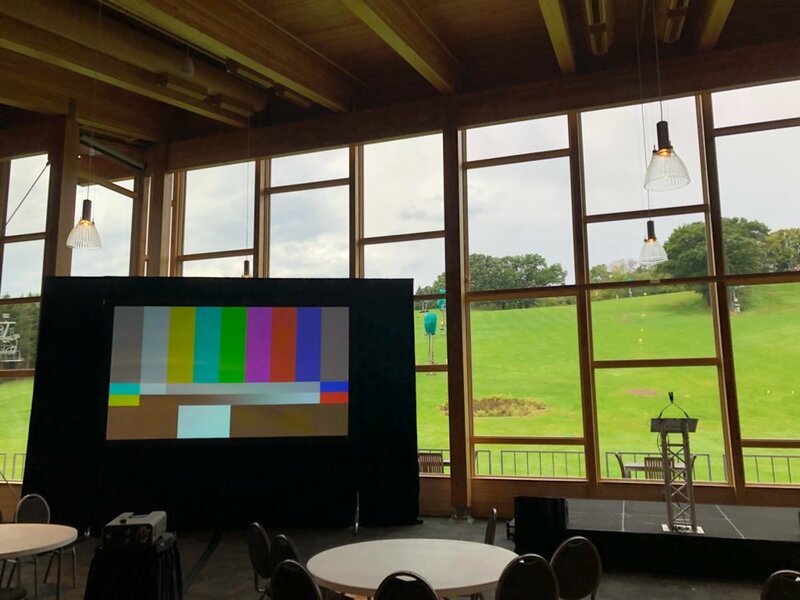 AV for You set up Audio, Video and Staging rental equipment for an FEI Twin Cities Event at Hyland Hills Chalet in Bloomington, MN. For audio rental equipment we provided four JBL VRX Line Array Speakers, an LTI Blox, and an Audio Technica Gooseneck microphone at the podium. For video rental equipment we front projected our Eiki 7KHD Projector onto a Screen Works 6.75’ x 12’ Truss Screen. For stage rental we constructed a 12’ x 8’ stage made up of six 4’ x 4’ stage decks. We used 16” stage legs, an 8” stage step and dressed it with stage skirting. We also provided a Truss podium on stage as well. At the tech table we used our Allen & Heath Zed 18 Channel Mixer and Shure QLXD4 Wireless Microphone pack for clear dependable audio. We utilized our Analog Way QuickVu Video Switcher and Playback Pro computer for simple switching between powerpoint and video rolls. We used Decimator HDMI/SDI Cross Converters to distribute video to the projector.